A one-of-a-kind educational programme that enables professional mariners in the off-shore sector to study for a degree even when they are in the middle of the ocean has won a national award for Plymouth University. The Hydrographic Academy, which was launched in 2012 in partnership with global geosciences company Fugro, scooped the Outstanding Employer Engagement Initiative at the annual Times Higher Education Awards – the higher education sector’s equivalent to the Oscars. Dr Richard Thain, Director of the Academy, received the award from guest host Jack Dee at the gala event at London’s Grosvenor House Hotel. 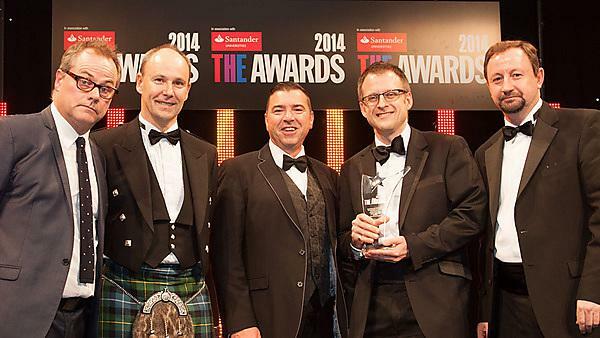 Plymouth was the only university in the region to come away with a THE Award on the night. The Academy provides professional development in subjects such as hydrography, oceanography and meteorology, and has been tailored to accommodate the realities of life at sea, with all of the resources available to them even when they are offline. More than 430 students have enrolled in the first two years from 38 countries, and they have access to tutors through web-based channels and via telephone, and that’s supplemented by intensive residential sessions during their shore-leave. The University was also shortlisted in the Outstanding Contribution to Local Community category, for its work with the Innovation Centres in Cornwall, which have created hundreds of jobs and engaged with their local communities in Truro, Pool and Penryn. Now in their tenth year, the Times Higher Education Awards are a highlight of the academic calendar, shining a spotlight on the outstanding achievements of institutions, teams and individuals in the UK higher education sector. The Minister for Universities, Science and Cities, Greg Clark, was also a guest speaker. The Hydrographic Academy was launched in June 2012. In November of this year the Academy became a subsidiary of IMarEST, the country’s largest maritime professional body. It is now trading as the Marine Learning Alliance at the Plymouth Science Park, and remains an Academic Partner of the University, who continue to accredit its programmes. We are delighted to have won - and this is just the beginning for us.